Travel and museum geek that I am, one of my favorite things is the Amsterdam Museumkaart (a card which you buy that provides you access to a bunch of museums in Amsterdam and surrounding area). Once a month I get their magazine full of ideas and it sets me off and running… or exploring. This month, it had the suggestion of going to see the Roman Catacombs in the town of Valkenburg. I’ve driven past Valkenburg en route to Belgium (Valkenburg is in the Southern part of the Netherlands, in a region known as Limburg. 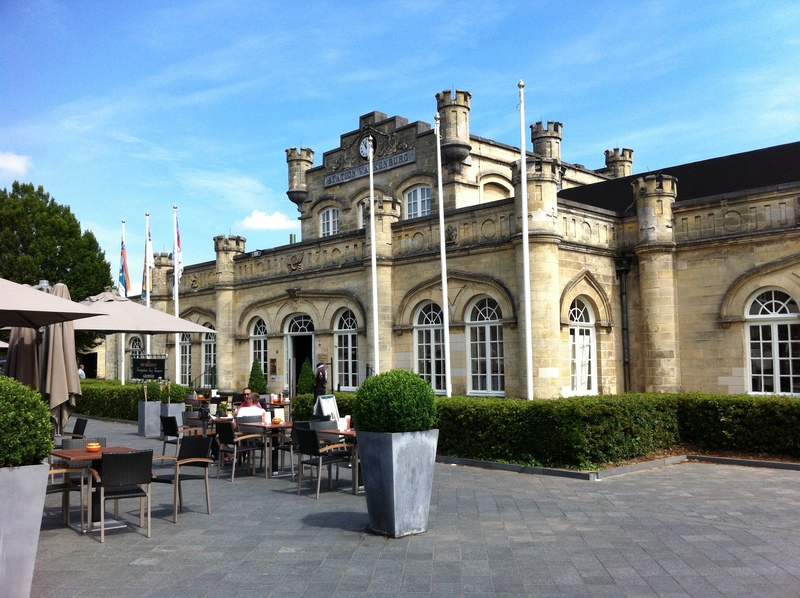 Close to Maastricht – a large city with ancient Roman roots). I knew that this region, which had once been incredible wealthy, is dotted with castles and large manors. And because of the Roman roots, I assumed that there would be Roman ruins. Right away I was struck by two things – silence and WARMTH! Even though it has been warm in Amsterdam the last week (read that with awareness of relativity), here in the ‘South,’ the sky was bluer, the sun was brighter, people were walking around in tank tops and tans, and it was warmer. Wonderful! And silence – few of the noises that go with living in a larger city. Setting off on foot to find the catacombs, I was a bit nervous. Based on my avid Google Maps research, the catacombs should be only a 10 or 15 minute walk away from the train station. But it was warm, humid, and you know my sense of direction… although it remains steady in Europe, I am always worried about tempting it to malfunction. The walk was lovely – beautiful buildings, winding streets, cafes, little B&Bs with inviting tables and chairs out front, flowers everywhere, people waving. I was enchanted. Descending several meters into the ground, into temperatures that are in the low 50′s Fahrenheit, with only flickering candles and one lamp to see by, over slippery steps… the guide hadn’t even said one thing yet and I was hooked! For an hour we were led through the catacombs and told the history and the explanations, and my historian-geekiness was hanging out in full grandeur. Turns out the catacombs are NOT Roman. They are replicas, or as our witty guide put it, a ‘backup’ of the Roman catacombs IN Rome. Now also approved as a Rijks Monument in it’s own right, this is a great way to get a sense of the catacombs in Rome, without the crowds. Our tour guide, Bert, was part of what made this so fun. A professional catacomb guide (seriously!!! ), he lives part of the year in Rome, touring folks through the tunnels there, and then also works here in Valkenburg, Paris and Sicily. He knows his catacombs and his death rituals! And he had every man, woman and child hanging on his every word and laughing with him for the entire hour. After the catacombs, off to explore the village! What a spot! There is the ruins of Valkenburg castle on the hill (one of the highest hills of the Netherlands! Keep in mind, this is a pretty flat part of the world! ), there are winding little cobblestone streets and old mill buildings, a beautiful church. Cute boutiques and shops, and one square after another with a plethora of flowered-bedecked cafés to choose from. Charming! Ruins, catacombs, architecture, friendly people, green hills, quiet roads with smooth cobblestones, and sunshine… what more could one ask for! Seeing Rome – Scooter Style!